Static websites are lightning fast, and running them inside an Azure Blob Storage instead of a WebApp is incredibly economical (less than $1/ month). Does it mean you need to do everything manually? Absolutely not! In a previous post I explained how to automatically generated your static website using a Build Pipeline inside Azure DevOps. In this post, let's complete the CI-CD by creating a Release Pipeline to deploy it. First thing first. If we want our release pipeline to deploy our website in Azure, we need first to be sure our Resources are available "up there." The best way to do this is by using an Azure Resource Manager (ARM template). I will use the same project started in the previous post, feel free to adapt to your structure or copy it from it. Create a new file named deploy.json in the deployment folder. We need a simple storage account. I used a parameter (StorageName) to define the name of the storage account. This way I could have multiple pipelines deploying in different storages. Not to make the ARM template accessible to the release pipeline we also need to publish it. 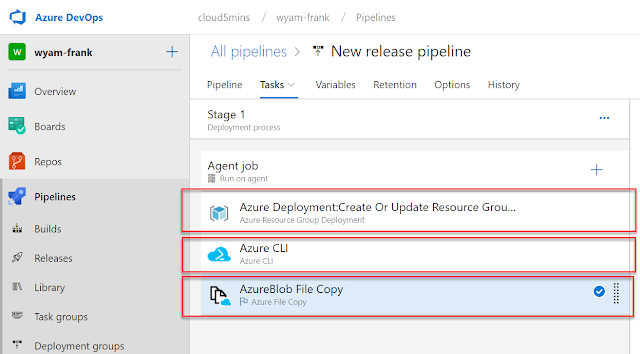 The easiest way to do it is to add another Copyfile task in our azure-pipeline. Add this task just before the PublishBuildArtifacts. Once you commit and push these changes, it will trigger a build. When done, the ARM template will be available, and we will be able to start working on the release pipeline. Navigate to the DevOps project created in the previous post. This time, create a new Release Pipeline. When asked, select an empty template, we will pick manually the tasks we need. First, we need to define the trigger and where are our artifacts. Click on the thing at the left of the screen. Select the build projects and let's use the latest version of the artifact to our deployment. To get a continuous deployment, you need to enable it by clicking on the lightning bolt and selecting the enabled button. Now let's select our tasks. Click on the "+" sign to add new tasks. 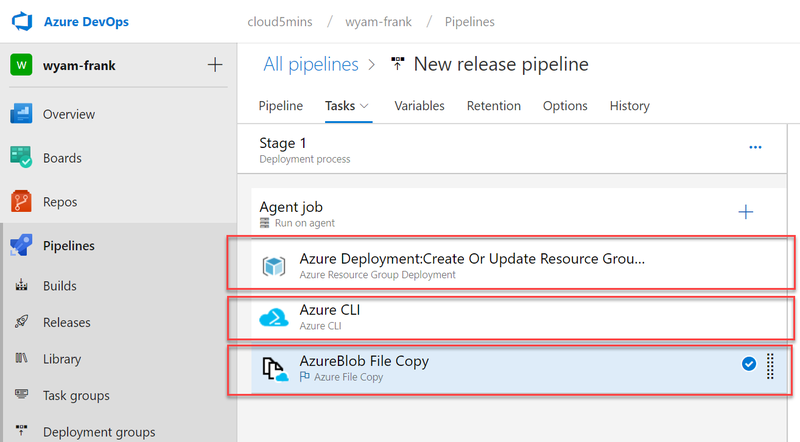 We need three of these: Azure Resource Group Deployment, Azure CLI, and Azure File Copy. The first one will be an Azure Resource Group Deployment. The will be used to deploy our ARM template and be sure that the resources are available in Azure. 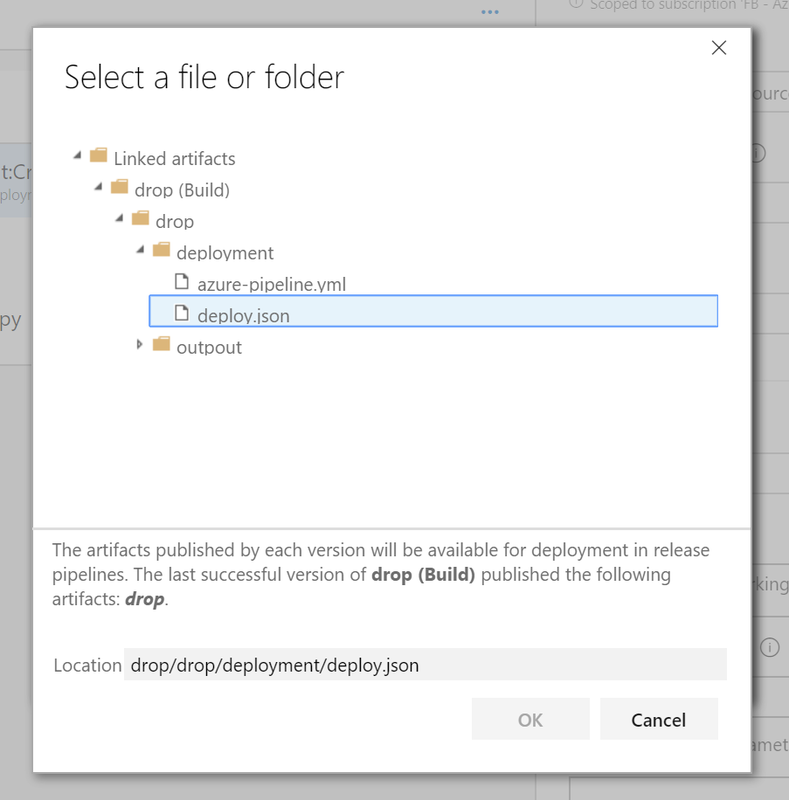 To configure the ARM deployment we need to select the Azure subscription and authorize the pipeline to have access. Then you will need to specify the name of the resource group you will be deploying into; it's location and finally points where is the linked ARM template. This will enable the static website property of the storage account named wyamfrankdemo, and set the default document to index.html. The last task is an Azure File Copy to copy all our files from $(System.DefaultWorkingDirectory)/drop/drop/outpout to the $web container (in our Azure Blob storage). The container must be named $web, that's the name used by Azure for the static website. Once you are done configuring the Release Pipeline, it's time to save it and run it. After only a minute or two (this demo is pretty small) the blog should be available into Azure. To find your endpoint (aka URL) you can go into the portal.azure.com and look at the static website property of the blob storage that we just create.